10 Best Shaving Brushes For Men 2019! 1.1 What Is A Shaving Brush? 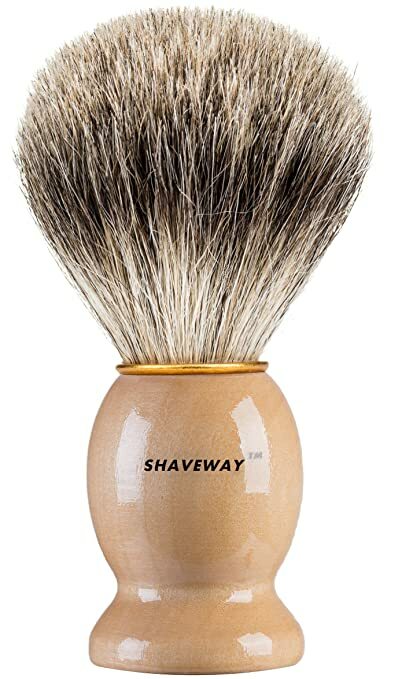 Let’s talk about shaving brushes – 10 Best Shaving Brushes For Men 2019! 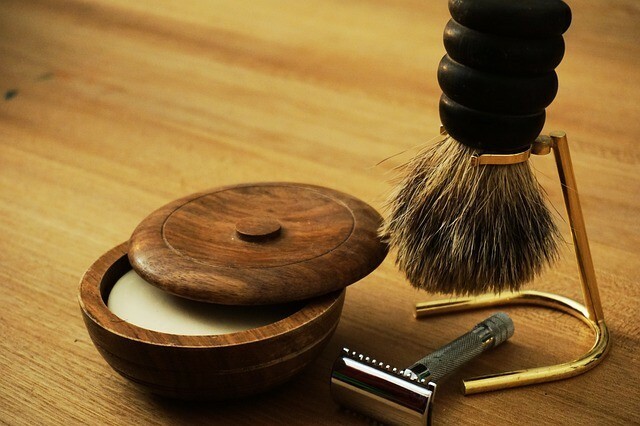 In this article, we will be looking at the definition of a shaving brush, the various types of brushes, and the benefits of using a shaving brush. In addition to this, we will take a look at 10 Best Shaving Brushes For Men 2019 to give you an idea of which one may be better for you! What Is A Shaving Brush? According to Wikipedia: ‘a shave brush or shaving brush is a small brush with a handle parallel to the bristles used to apply soap or even shaving cream to the face when shaving.’  Shaving brushes were first introduced in the 1750’s circa France. Pure – this is made for the underbelly of the badger, this hair covers about 60% of the badger’s body. It varies in softness, pliability, and color. The hair tends to be coarser. Brushes made with this type of hair is often less expensive than the finer badger hair. Best – this brush is made with finer badger hair, from 20-25% of the badger’s body. It is also longer in length and lighter in color than the pure badger hair. It is also denser than the pure badger brush and will produce a greater lather. Super – this is more expensive than both pure and best badger hair. Even though it is common practice to call the type of hair ‘silvertip’, it really is high-grade hair that has been bleached on the ends to look like its counterpart. Silver Tip – this is the most expensive and rare type of badger hair. ‘The tips on this hair appear white naturally, without bleaching. 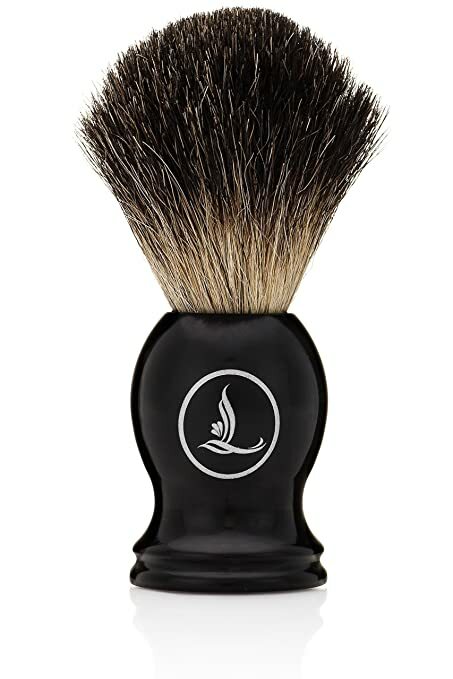 A “flared” bristle load results in the ‘silver tip’ brush’s fluffy appearance and lends the brush its ability to hold a large amount of water. Due to its water retention capacity, a ‘silver tip’ brush can create well-formed shaving lather quickly and easily’. Mixed badger hair – fairly popular because of the cost. It is mainly the left-over hair after the grading has been done for the silver tip, best, and pure. Synthetic hair – these are classified as ‘G2 or Generation 2’. 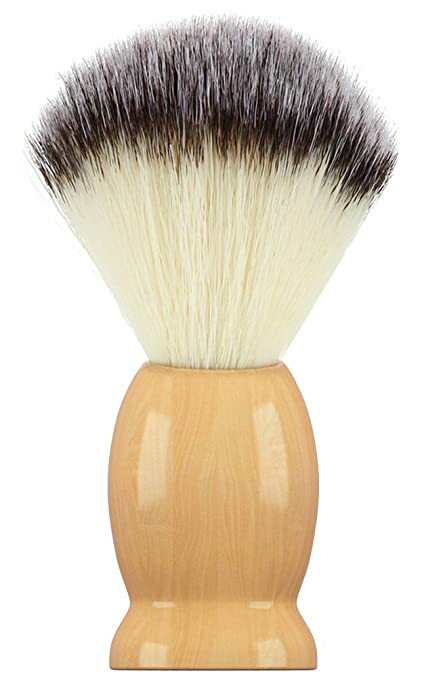 This type of brush mimics the lathering quality of a high-quality badger hair brush. They travel well because the dry quicker than badger hair brushes. They also don’t shed as much, are soft on the face, do not smell, and are sturdy during use. 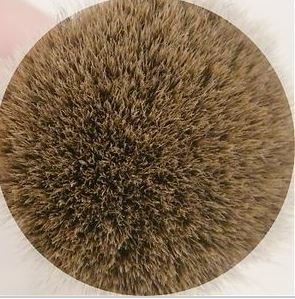 Boar hair – these brushes are less expensive, and the boar hair comes from China, Russia, or India. The bristle is not as flexible and may feel prickly against the skin and gives the skin a good exfoliation! Finest Badger – this type is produced from a long-haired species of badger that is only native to the most remote areas of China, like the Guangxi province. The handles are important for the brush; however, you will find that the most expensive component of the product is the ‘hair or bristle’. It is quite simple. You can usually find the shaving soap in its own container and then all you have to do is to wet the shaving brush and then rub against the soap until it lathers. 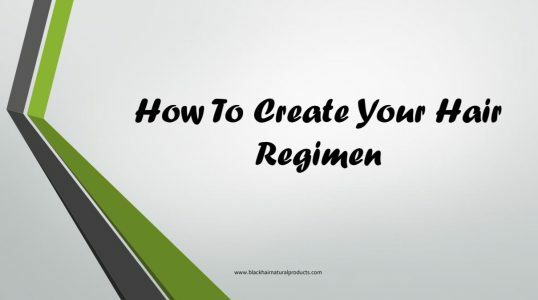 Using the shaving foam, gel or cream is with the same principle though you may find it easy to apply with your hands and fingers and then use the brush for application. A good quality brush will hold enough water to mix with the soap. The more water it holds, the richer the lather. The thicker the lather, the better the shaving experience. It also acts as a gentle exfoliator for the skin. If the brush is used with a shave soap, the effect can replace a pre-shave routine of washing the face and then applying lotion to the facial skin. A shaving brush also lifts the facial hair before a shave, and this action makes it easier for the razor. At this point, we will now take a look at 10 Best Shaving Brushes For Men 2019 and see if there could be one for you or for one of the men in your life. 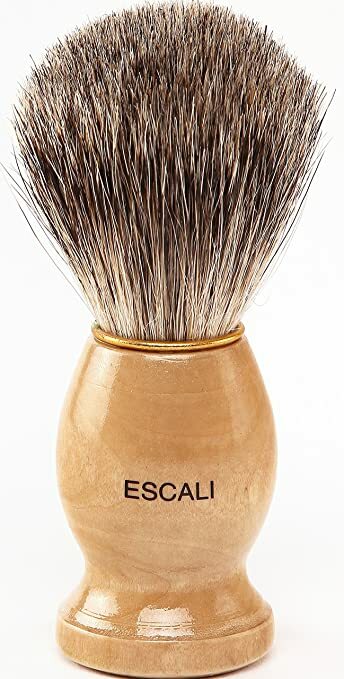 The Escali brand is made from 100% pure badger hair and based on the feedback of over 7500 users, it is no small wonder that it is on the 10 Best Shaving Brushes For Men 2019. Easily works up a full lather that makes it easy for a smooth shave. Holds and retains water because it is super absorbent. Is a great exfoliator for your facial skin which leads to a closer shave and a softer feel. Made with excellent quality badger hair and real wood, along with a good design which should last for a long time. Minimal bristle loss as long as you care it well. 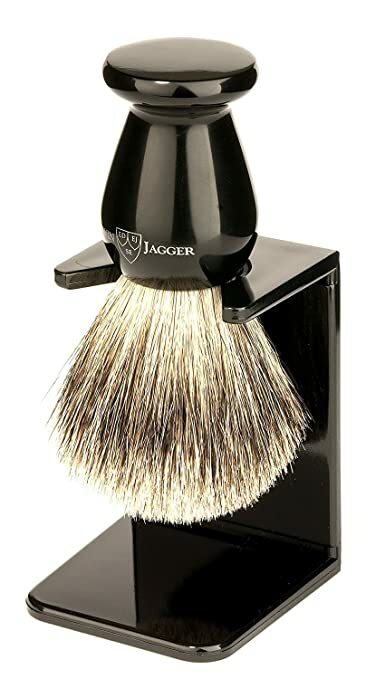 I think this would be a wonderful investment in your arsenal of shaving tools! 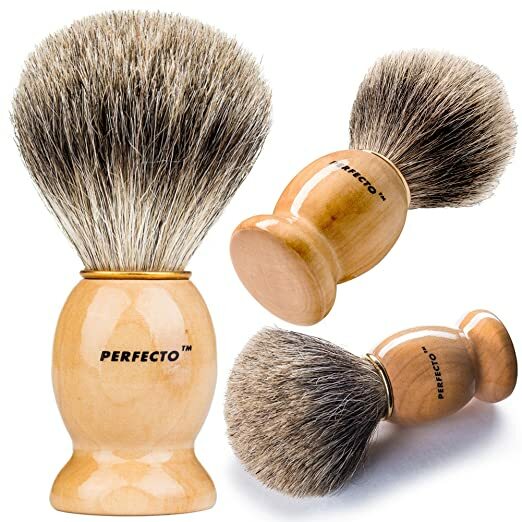 Another great brand when it comes to shaving brushes, another great find to add to this 10 Best Shaving Brushes For Men 2019 list, is the Perfecto shaving brush. Gentle on the skin and also a great exfoliator. Retains water and helps to give a wet shave. 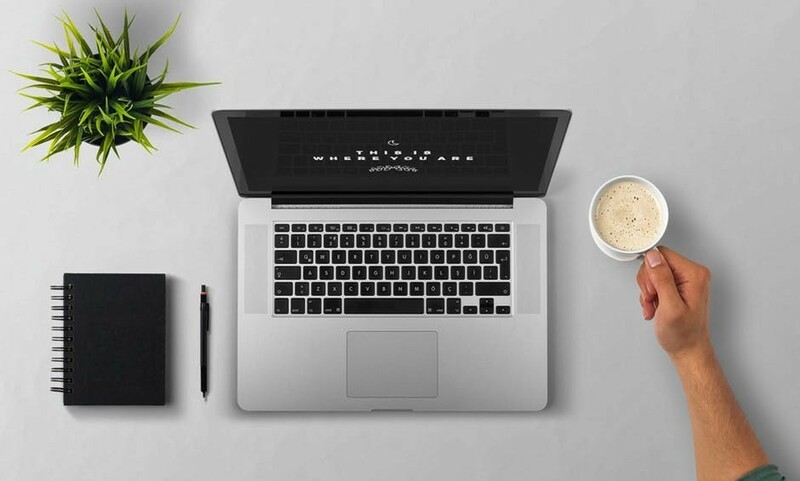 Designed with an ergonomic handle for a firm grip and easy use. 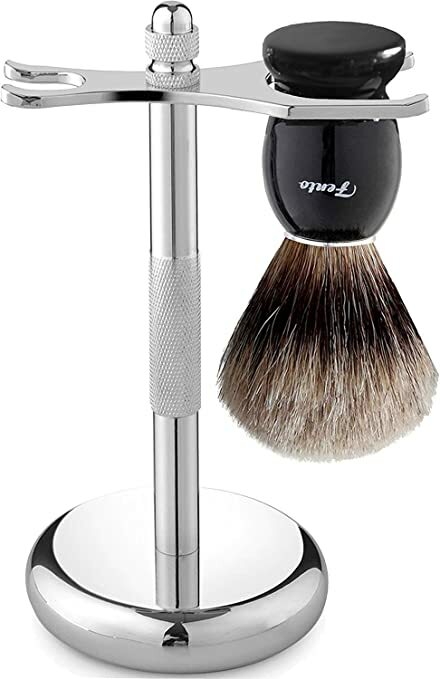 This shaving brush also fits nicely in the “Perfecto Deluxe Chrome Razor and Brush Stand”. Not to be concerned, the brush may initially smell like the badger which is a sure sign of its authenticity, and this will go away with use. Also, it is suggested to use warm water versus hot water to help extend the life of the brush. Exfoliates the skin before you start shaving and while you shave, especially if you should do it a second time. Lathers easily. Firm and well-designed handle for easy use. The shaving brush also fits ideally in the “Deluxe Chrome Razor and Brush Stand”. As a note, there might be some shedding for the first few times of use. 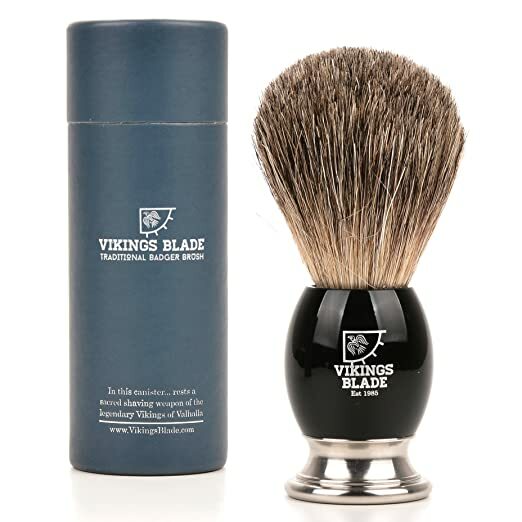 This Vikings Blade shaving brush has been upgraded and has a few more enhanced features for it. Now has a heavier Swedish alloy base weight with an ivory-tusk-colored acrylic handle. Does not entangle your hair. Comes with a 90-day guarantee. Of course, as with all brushes, the break-in period might cause some shedding of the bristles. 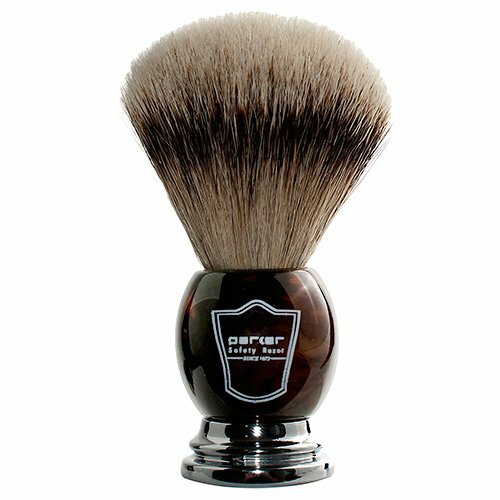 The Parker shaving brush is another shaving brush worthy if mention. Parker Safety Razor has been in business for more than 40 yrs. 100% genuine silver tip badger bristles with 22mm brush knot. Holds and retains water well. Includes an acrylic brush/drip stand to allow for easy drying and storage. A little of information, shaving brushes made by Parker are hand-made so you can be sure that a lot of care has gone into its production. The gift box packaging is also nice. Parker is another popular brand for shaving brushes and don’t be surprised if you see more than one type featured here on this 10 Best Shaving Brushes For Men 2019 guide. Well, one thing is for sure, shaving brushes made of badger hair are a lot more popular than the other possible types of shaving brushes (see above). Solid wooden handle made of real wood. Great design for easy and comfortable use and is 4-inches long. Can also be a great exfoliator for your facial skin area. Lathers easily and very creamy. Edwin Jagger is a well-known manufacturer of shaving brushes. 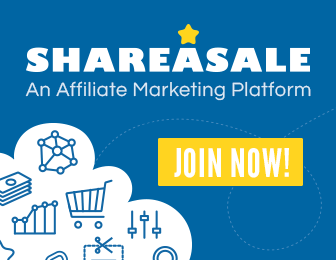 Once you purchase a product with them, you have the choice to register with the company to ensure continuous customer service. This shaving brush comes with a drip stand. Lathers easily and give a rich lather. Comes with drip stand to make it easy to dry once you finish shaving. It is suggested to rinse thoroughly after each use so that you can help prolong the life of the shaving brush. Here is another best badger grade brush. This one is made by Latherwhip, and a very interesting name I might add! 100% rare black badger hair brush. Holds and retain water well. Lathers well and more quickly than other shaving brushes. Quality designed resin handle which is ergonomically designed for an easy fit and more long-lasting than wood. 22mm knot which will hold the bristle tight over a long life of using and 54mm bulb loft. 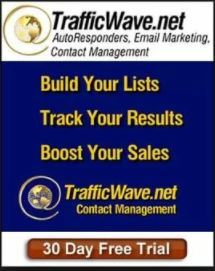 Lifetime warranty and free replacement; no restrictions on the place and date of purchase. This shaving brush comes in a nice gift box as well. I would be tempted to purchase this brush because of its lifetime warranty and clauses. It is almost like a win-win situation indeed. 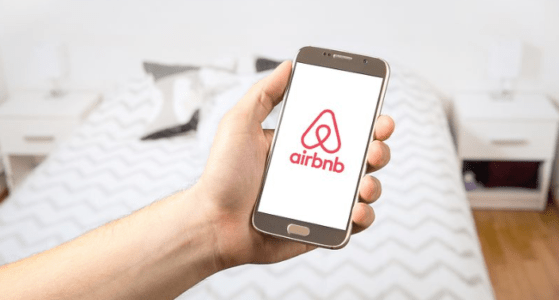 The company has also done research on the size of the best knot and it was found that 22mm is the best to provide the best shaving experience. 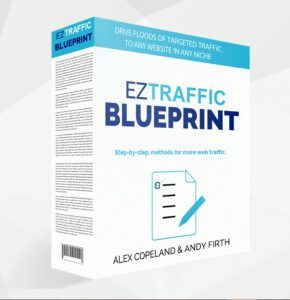 According to AJ Hardy – Latherwhip Founder. The Fento Shaving brush comes with a chrome razor stand and this is a great combination for a purchase. Creates a rich and creamy lather. High-quality stainless steel stand, chrome plated, weighted base for stability as well as a non-slip sole. I think that shaving brushes which come with a stand automatically ‘forces’ the user to be mindful of cleansing and allowing the brush to dry well so that the life of the brush can be sustained. Great combination idea for the manufacturer. Parker Safety Razor has been around for more than 40 yrs and is very aware of the grooming needs when it comes to the ‘gentlemen folk’! They pride themselves on being leaders in the grooming industry. 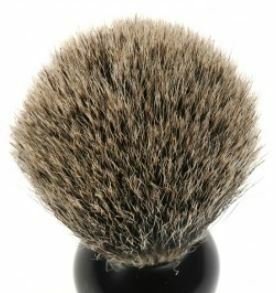 Here is yet another shaving brush which is made with best badger hair. 100% best badger hair brush. Extra Dense 22mm brush knot which also helps to prolong the life of the brush. Excellent exfoliation for the facial skin. Comes with a Lucite shaving stand to help the brush to dry. Handmade shaving brush with attention to craftsmanship. This set comes in a nice gift box as well which makes for a very nice presentation. 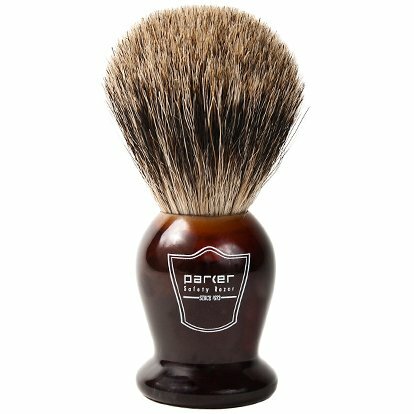 Parker is quite convinced that their shaving brush is the best on the market especially when it comes to the type of badger brushes they manufacture. They also say that their ‘pure badger grade is comparable to many of the brushes that other companies market as “best badger” and “fine badger”. These are our best-selling brushes.’ I think you can’t go wrong with a test-drive of one of their shaving brushes. Well, I must say that you will have a good selection of shaving brushes to choose from as you read this 10 Best Shaving Brushes For Men 2019 list. It is such a personal experience when it comes to making a choice for anything. It is my hope that this 10 Best Shaving Brushes For Men 2019 guide will be able to help you in your decision-making. 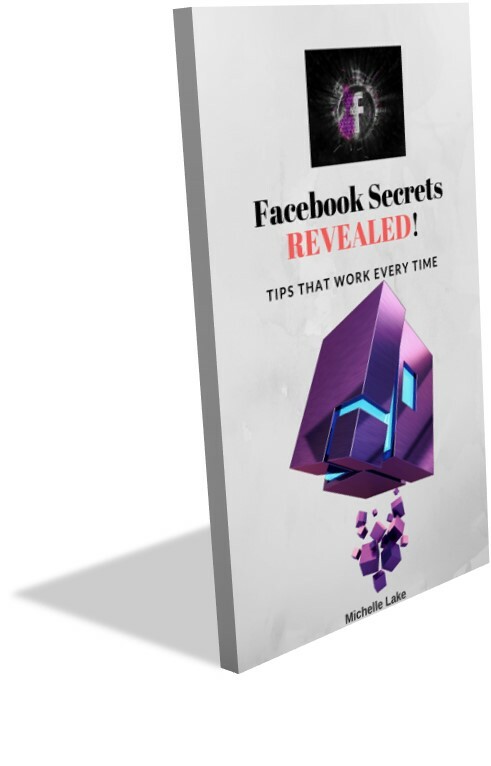 If there is anything that I can add to this guide to help improve its usefulness, be sure to drop me a line. All the best. Images courtesy of Pixabay, Wikimedia, and Amazon. I never knew the purpose behind a shaving brush. I am going to have to come back to this article around Christmas time for a few men in my life. These would make great presents. When you can come back to a website and the see other valued information to fit your need, it says a lot about the person that is behind these articles. 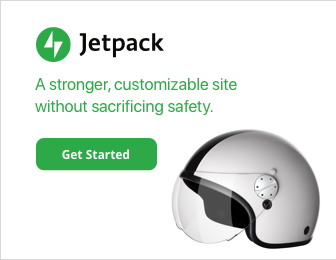 Many times articles are presented without facts and detailed information about the product. And you are not given enough information to make a decision. Not in this case. 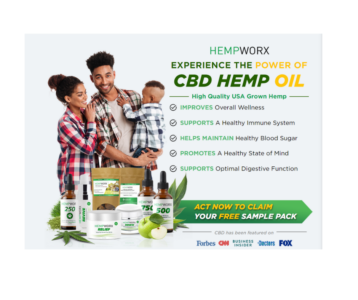 As one of your customers, I must say that your recommendations are working for me, and I thank you for your continued support of men’s products that is not only affordable but help with sensitive skin as well. Will take a look at the various one and make a decision, but boar hair brush stands out as of now. Thank you for the information. Thank you for your kind words. I am glad that you find useful information here! 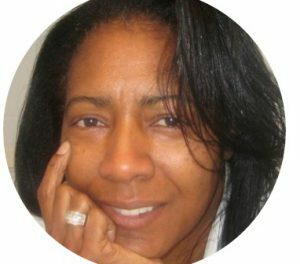 I will continue doing research and ensure that readers like yourself find the information that they seek and that they ‘keep coming back for more!’. 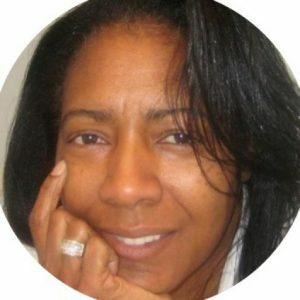 Please drop a note if there is anything that I can research and write about for you. Never ever thought or came across these many options on shaving brush, got lot of new information. Thanks a lot. The best thing is you provided different types of brushes with advantages and with all details, probably next time while purchasing a shaving brush I need to choose one from this post you suggested. HI Michelle, this was an excellent explanation of shaving brushes. Prior to reading this, I did not know the different types of boars hair brushes, not to mention all the other types as well. Yes, I found the information just as interesting while I did the research. I am glad that you found value in it. All the best. As an artist I love the idea of brushes used everywhere..these are some really great gift ideas. Most of the men I know just go for the fingers and hands approach …But i bet it feels good to use a brrush against your skin? LOL, too funny Ariel. Thanks for stopping by. Yes, there is a whole ‘big’ world out there of brushes and yes, it would indeed feel good on the face as an exfoliator! And yes, the fingers do feel good too.